Basic and practical protection of the knees. Light weight. The plain shape provides perfect movability. Steel knees have leather straps and laces to be fixed properly at the place they should be. This is ideal supplementary to your armor. Price for the pair. Please notice, that measurements should be with padding/gambeson. 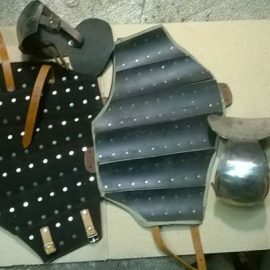 Armoured complect of plate legs is what you need if you are looking for reliable and qualitative armour for significant battle reconstruction or historical fencing championship. Made of 1.5mm cold rolled steel. 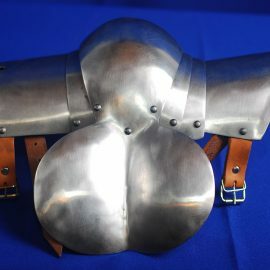 This armor has excellent protection qualities and gives you good mobility. Please notice, that measurements should be with padding/gambeson.